I have to throw that mama of mine under the bus for just a second because these burgers sound like something she would love. However, these are something that she would love find in the frozen foods section at CostCo. My mom prides herself on finding the healthiest of frozen convenience foods. For the past several summers, she’s had to boast about numerous frozen burgers she’s found — chicken, beef…whatever. But I’m pretty certain she’s never tried a salmon burger. Being a salmon lover and having just returned from the Pacific Northwest, it baffles me that people don’t get weak in the knees over salmon. In my mind, it doesn’t hold a candle to any other fish taste-wise or nutrition-wise. That said, I know that everyone has different food preferences and we can’t help what we like and don’t like…but we have to be willing to give things a chance. Maybe even a second chance. If you’re on the fence about salmon, I can’t think of a more perfect dish to give salmon a shot. The flavors of salmon are complimented with bold flavors of soy sauce, toasted sesame oil, hoisin, and cilantro…plus several slices of crunchy, pickled cucumber for texture. As for you, Ma…these take about 10 minutes to throw together. CostCo’s frozen section aint got nothin’ on these! 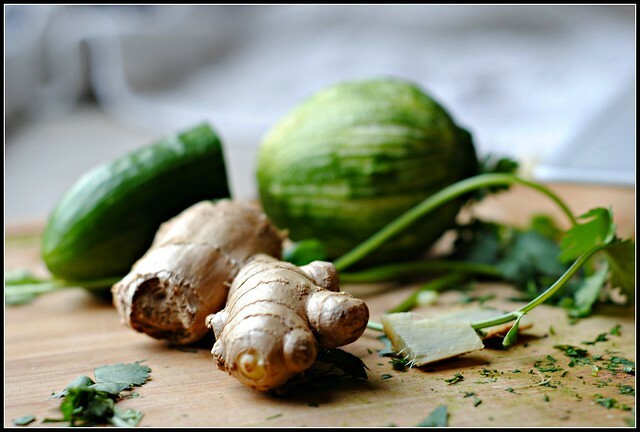 Combine the first 6 ingredients for the cucumbers in a small saucepan; bring to a boil. Remove from heat; add cucumber. Let stand 30 minutes. Drain. Combine panko and the next 7 burger ingredients (through egg white) in a bowl, and stir well. Divide the mixture into 6 equal portions, gently shaping each into a 1/2-inch-thick patty. Heat a large cast-iron skillet over medium-high heat. Add sesame oil to pan; swirl to coat. Add patties; cook patties for 3 minutes on each side or until done. Brush tops of patties evenly with hoisin; cook for 30 seconds. Place 1 patty on bottom half of each bun; top each patty with 4 cucumber slices and top half of bun. 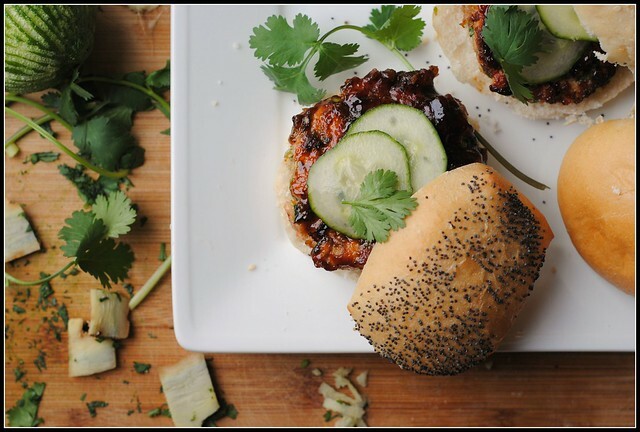 Result: Sweet and a bit spicy, these bold Asian flavors season these salmon burgers beautifully. These burgers are on the “large slider” side, so 1 with a side or 2 as a meal would be appropriate. I think a fun side would be an Asian slaw with cilantro or some grilled asparagus or other veggie. 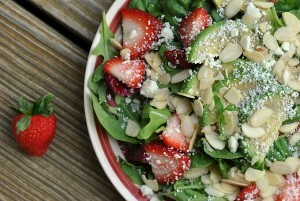 A quick, delicious meal perfect for summer. Enjoy! I am off today. Lily has a vet appointment, I need to return my rental and pick-up my car (hopefully), and I have a going-away gig about an hour up north with the weight loss group Donna and I ran last summer. I think I’m finally up for a workout after my 3-day recovery from hiking, too! Oh I am SO in!! I wish I could find some lower sodium hoisin but I’ll have to budget for ’em sodium wise. YUM! Nicole, these look so good! I often buy salmon with the intention of turning it into burgers, but then take the easy route and just do a simple broil. But summer always gets me in the mood for burgers. Beautiful photos too! I love salmon burgers, too. And that cucumber pickle! I have half a cucumber, unused, in the fridge as we speak… I think I know what to do with it now. That’s funny because I just had a frozen salmon burger last night – that I bought at Costco! Love them! Okay, so I may have to give salmon another go with this flavor! My hubs loves salmon so maybe I can sneak this onto our menu! It is so hard to say bye. I have been thinking about leaving my job to try something different. It is hard to think about leaving my coworkers though. But I can’t wait to hear all the adventures you will have ahead!! Oh and those burgers look fantastic! 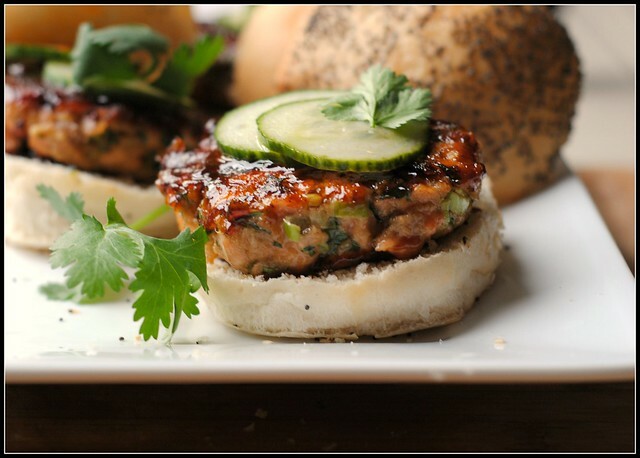 We would LOVE these burgers – huge salmon fans around here. Sometimes my grandma in Alaska sends us frozen wild salmon fillets (caught that morning) that taste so fresh I think that people who claim to dislike salmon just haven’t had great salmon. I can’t wait to try this recipe. Look amazing! Does the nutritional info include a bun or is it just for the burger and pickles?? Mia: The bun is included, yep! They were bakery buns/slider buns…smaller and fluffy! My mom would be happy with the frozen version of these too! 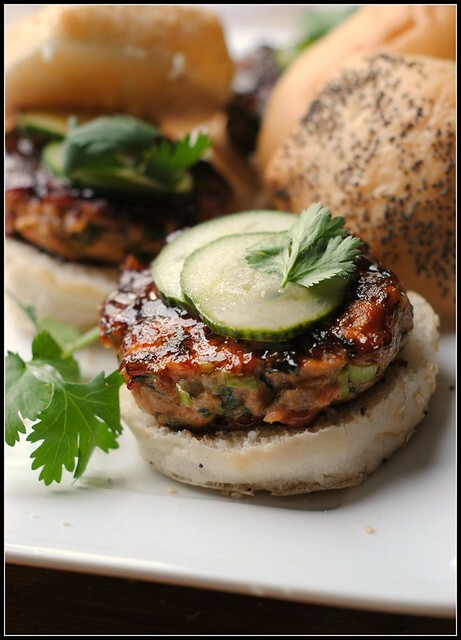 We absolutely love salmon, hoisin sauce and pickles so these are a match made in heaven for us! 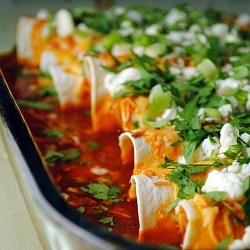 I made them this morning and cooked them when I got home tonight for a quick weeknight meal. I used the Pure Alaska canned salmon and they came out great! Thanks for sharing. These are so right up our alley. YUM! I love these!! I made them and then froze them – all I needed to do was defrost it and then popped it under the grill with the bread to heat them up 🙂 Didn’t have time to make the cucumber so just put tomato, cucumber, bean sprouts and baby spinach on top 🙂 YUUMMM!! !